The BEST soft and fluffy homemade Dinner Rolls recipe! Enjoy homemade rolls any day of the week but especially for Thanksgiving and holidays! The season of all things comfort food is finally upon us!!! 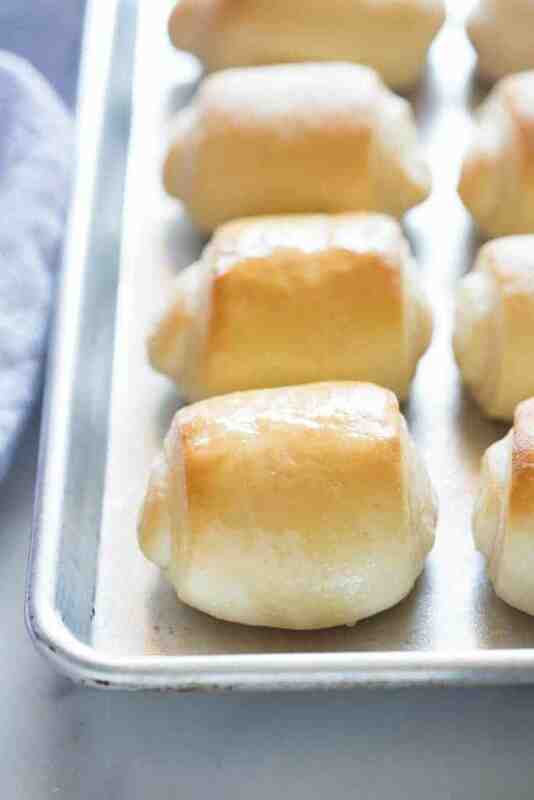 I’m convinced there’s nothing yummier in this world than a warm, light and fluffy, homemade roll. And the best part about homemade bread is how EASY it is to make! I think a lot of people get intimidated by homemade rolls, but follow the instructions below and you’ll see just how easy they are! The only thing you need is time. Time to let the rolls rise. The rest if very simple and fast. 1.) Don’t add too much flour to the dough. 2.) Allow the roll dough to properly rise. 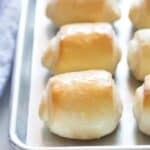 This is my ALL TIME FAVORITE recipe for homemade rolls. They really are the best. I shared this recipe many years ago here on the blog, but it was in desperate need of new photos and I’ve changed the way that I roll them. I used to roll the dough into a big circle and cut it into triangles to make “croissant” shaped rolls. Over the years I’ve found that rolling them into a large rectangle makes it easier to cut them evenly, and it’s faster, too. First, roll your bread dough out into a large, thin rectangle about 1/4” thick. 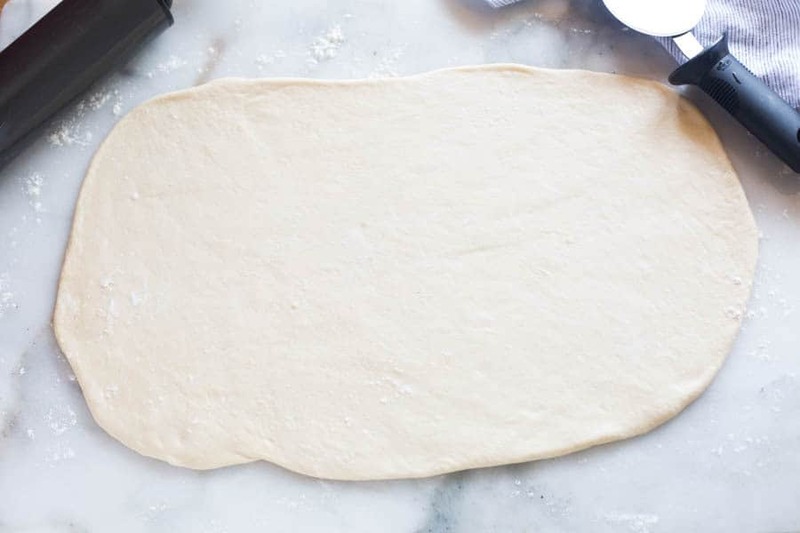 Next, use a pizza cutter or sharp knife to cut the dough, lengthwise, into two pieces. Then slice the dough into six strips across so you end up with 12 small rectangles. Roll each small rectangle up like a snail and place it, open edge down, on a lightly greased or lined baking sheet. Bake the homemade dinner rolls at 375 degrees for about 10 minutes. 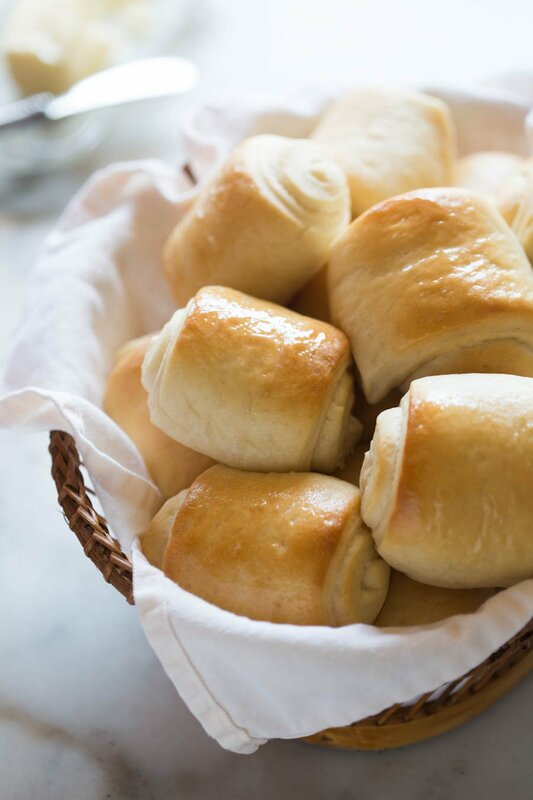 When your rolls are fresh out of the oven, use a cold stick of butter to lightly butter the top of each warm roll. Can I make dinner rolls head of time? You can make these rolls in advance. Simply put them in the fridge for the first rise and or second rise time to slow down the rising process. Then bake them just before serving! Nothing beats a warm homemade dinner roll. 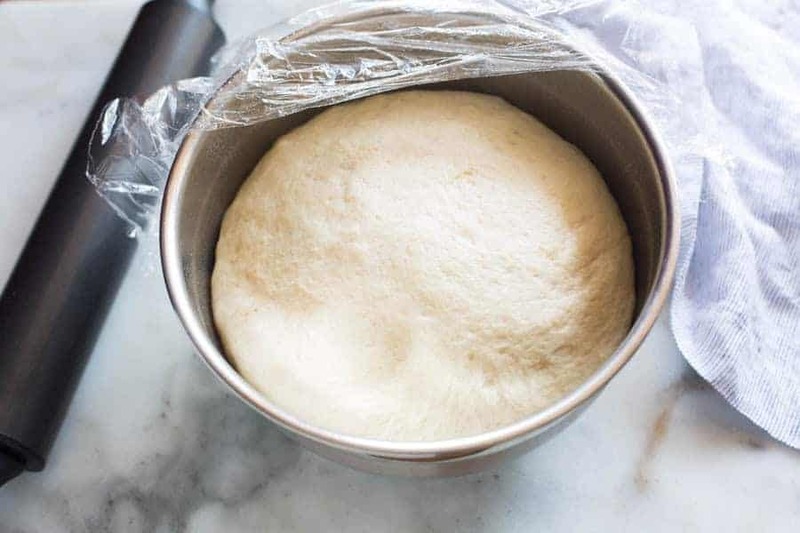 Can I freeze homemade dinner rolls? You can definitely freeze these dinner rolls. Throughout the fall and winter I pretty much have a supply of these rolls in my freezer at all times. My kids love them at lunchtime as a sandwich or with some tunafish and pickles. My husband loves them as a side with dinner.They freeze beautifully. 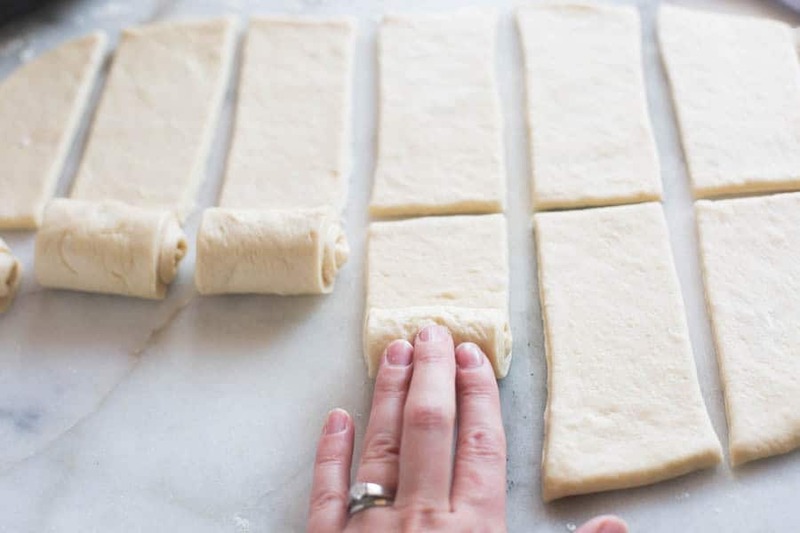 To freeze these rolls, first bake them as instructed and allow them to cool completely. Then put the rolls in a gallon freezer bag and store for up 1 month. When ready to eat, just pull them out of the freezer and allow them to come to room temperature before eating or pop one in the microwave for a few seconds, and serve warm. Super soft, light and fluffy homemade dinner rolls. Combine warm water, yeast, and 1/4 tsp sugar and stir--allow to rest for 5-10 minutes until foamy. Pour yeast mixture into the bowl of an electric stand mixer (or into a large bowl if you plan on kneading by hand). Add remaining 1/3 cup sugar, warm milk, butter, egg and salt. Blend mixture until combine. While mixing on low speed, slowly add the flour, mixing until the dough is smooth and elastic, about 5 - 6 minutes. You may not use all of the flour called for! The dough should be soft, very slightly sticky when touched with a clean finger. It should be pulling away from the sides of the mixer. Cover the bowl with plastic wrap. Allow to rise in a warm place until double in size, about 1 hour. Divide dough into two equal portions. Roll each dough ball out on a lightly floured surface into a large rectangle about 1/4’’ thick. Use a pizza cutter or sharp knife to cut the dough, lengthwise, into two pieces. Then slice the dough into six strips across so you end up with 12 small rectangles. Roll each small rectangle up like a snail and place, open edge down, on a lightly greased or lined baking sheet. Repeat with the second portion of dough. Cover rolls loosely with plastic wrap and allow to rise again in a warm place until double in size, about 1 hour. Preheat oven to 375 degrees F. Remove plastic wrap and bake rolls for 10 - 13 minutes until cooked and golden brown. Remove from oven and brush tops with butter. Store rolls in an air-tight container. They also freeze really well. Tips for making perfect rolls as well as process photos are in the post above! I made these for dinner when we had some guests staying with us and everyone raved! They were so EASY! I made them early and let them rise (for the first rise) in the fridge. I followed the directions exactly and they were perfectly light and fluffy. I also froze the leftovers and we have been enjoying them for weeks. I will definitely be making these for thanksgiving! How early did you start these? And how long did it take for these rise for the first one in the fridge? Made these with whole grain wheat flour last night and they are amazing. The kids and the husband wanted them for breakfast. I doubt I will have leftovers to freeze, but appreciate that you’ve tested it (next time I’ll do a double batch). Thanks so much for sharing! I’m happy to hear your family loved them–and I love that you made them whole wheat! The dough was very sticky and not easy to shape. Would that be because I didn’t use enough flour.The rolls were delicious but not shaped very good. Your rolls are fabulous! I made them for Thanksgiving and it is now my favorite roll recipe. I doubled the batch so we would have plenty. I love the way they are rolled out-much more uniform than the crescent shape. Excellent! WOW! another great recipe from your site. I’ve never made homemade bread, because I always thought it was so labor intensive – I was wrong! I will be baking these rolls more often now. Super easy, super soft and delicious – everyone loved them. Super yummy, the next day as well. These rolls are wonderful. It is just the recipe I have been looking for and it is so easy. I measure my flour by weight using 120 g per cup. I find that I have to use 6 or more cups of flour measured by weight to obtain the slightly sticky dough. My rolls are light and fluffy, so I don’t think I am using too much flour. How are you measuring your flour?